I just bought a 1973 240Z last weekend, and I have been going through it, getting it road worthy. I spent last weekend tearing apart the carburetors, and I finally got them all cleaned up and put on tonight. The carb linkage seems a little strange, considering when I went to remove it, a zip tie was holding it down (see photo). What is this? How SHOULD it be setup? There are 3 little L bars, but every image I see of 240Z's, there is only 2, and no screw. Oh, these are '72 round top carbs obviously, the flat tops were ditched at some point by the original owner. I have that same set up on my 260z. And that doesn't do anything as far as adjustments go. I believe it was connected to a part of the emissions that has been removed. So shouldn't effect carb tuning, at least it doesn't on mine. The screw on the right is your idle adjustment, not the balance. That's the balance adjustment screw on the left. Fiddle with your throttle linkage and you'll see it clearly. 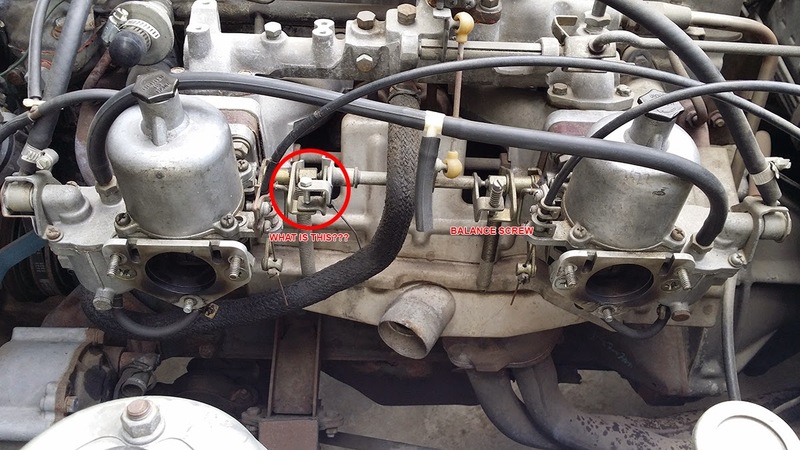 Adjusting the screw on the right will change the idle position of both carbs and the screw on the left changes the offset between the linkages of the two carbs (balance). Round top carbs are the way to go btw. Be glad those flat tops are gone. You can get more information at ZTherapy.com. You can even call them for advice. Talk to Bruce, he's a good guy. Thanks for the help. I was able to get the linkage adjust properly today, and the car runs great. PDF has been stored in my Z folder. That's great. Glad you got it running. How about some photos of your Z? Thanks for the photos. That car looks like a great find, congratulations! Weird weird electrical problem for a new 130 owner.